NAVIGAMUS BLOG A VELA: Régates Royales - Trophée Panerai : The heat is on for the 40th Régates Royales! Régates Royales - Trophée Panerai : The heat is on for the 40th Régates Royales! The weather is pure Cote d’Azur in Cannes, sunny and summery… Ideal conditions for the grand rendez-vous that every year reunites hundreds of classic yachts’ lovers. The crews are itching to start racing on the stunning bay of la Napoule and finish the anniversary edition of the Regates Royales - trophée Panerai in style. As usual it was the Dragons to get the ball rolling, with their first race of the series, after a pretty long wait for the wind to set. Two German-flagged boats, Meerblick skippered Otto Pohlmann and Nicola Friesen’s NN, together with local expert Gérard Blanc are the early leaders of the 50 boots-strong Dragon fleet. With a variable, shifty 5 to 7 knots strong wind, the Race Committee and the sailors had to use some patience and wait for the right setup to launch the first race of the 2018 Dragon series in Cannes. Characteristically, the level of competition among the 70 years old one-design class is extremely high, with reigning champion, the Russian crew from Annapurna, skippered by Anatoly Longinov who will have to fend off the attacks from several serious contenders to the title. Today’s victory went to German-flagged Meerblick skippered by Otto Pohlmann, followed by fellow countryman Nicola Friesen on NN and Cannes-based skipper Gérard Blanc on Tsuica II. 200 classic yachts, split on three different race areas, will make their debut tomorrow at 11 am, with some 20 knots strong easterly, a breeze that wlll accompany the old ladies with their huge sail plans. Undoubtedly a great show to watch but also a situation that will make the crew’s life more complicated, with careful boat-handling and manoeuvres needed. The big fleet will be divided in 12 different groups, with imposing schooners like Mariette (32 metres long and dating from 1915) or the handsome gaff cutter Moonbeam IV, in the Big Boats’ class. 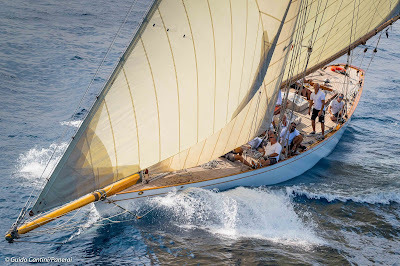 The more recent Marconi-rigged boats will also be part of the spectacle, with racers like the fast maxi yacht Il Moro di Venezia from Italy or tiny Dainty, which is only 8 metres long Sunbeam one-design built on the Isle of Wight in the 1920’s. Tofinou 9,50, 5,5 m I.R., BOD (British One Design) and Spirit of Tradition, will also battle for final victory in this 40th anniversary edition of the Régates Royales de Cannes. It’s the number of volunteers at the Régates Royales de Cannes, dozens of men and women who work ashore and at sea to make the event a well oiled and successful machine.No less than 17 people are needed to manage the huge sails -730 square metres of sail area- on board this 23.40 metre (14.85 LWL) long and elegant gaff cutter designed by William Fife III and launched in 1908. 17 sailors who work on three different areas on deck: bow, centre and back. “There’s someone in charge for each area, and every sail. Everyone knows exactly what to do and everyone knows each other,” explains Benjamin Redreau, boat captain on Mariska since 2013. No winches on this pure racer, but a strong and experienced crew. Sébastien Audigane, who has some 180.000 miles in the Imoca and Figaro classes and on maxi multihulls, is at the helm with the experienced and versatile Christian Ponthieu, calling tactics. “The team spirit is our secret weapon.” Says Benjamin, who sets Mariska’s season’s programme together with Christian Niels, and is once again back in Cannes to defend her title.